Have a Week in Morocco? Here’s 3 Ways to Spend It. So you’ve booked a flight and have one week in Morocco. Where do you go and what do you see? This can be the hardest decision to make! The reality is one week isn’t enough time to see the entire country. I know many travelers who try and pack multiple cities into a single week. They often leave grumpy, tired, and let down. Morocco is a big country and getting from point to point often takes much more time than the map lets on. 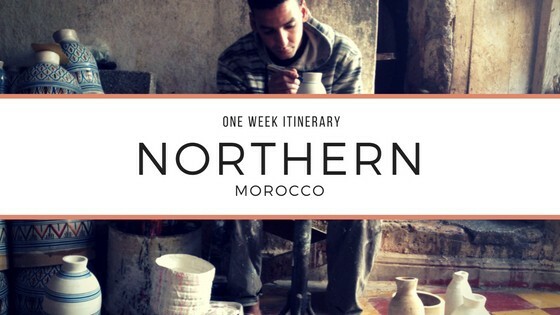 I put together three different one week Morocco itineraries that you could easily do. Travel to Marrakech, the south of Morocco or Fez in the north to make the most of your time and have a good experience. These 1 week in Morocco itineraries will give you enough time to explore without feeling exhausted and beaten down. If you’ve got a little more time there’s a bonus idea at the end of each where you could add on some more time. You also might want to take a peek at my post on Morocco for first time visitors before you go. Fez has a small airport and you can get a flight from Europe directly to Fez or a connecting flight from Casablanca to Fez. Chances are you’ll arrive in Casablanca as it’s the largest airport in the country. From here getting to Fez is between a 3-4 hour drive depending on traffic. Have dinner waiting at your riad/hotel for the first night to save you some hassle. If you have time on your first afternoon/evening get to know the immediate area near your accommodation. Try to go to sleep at the time you would at home (if you go to sleep at 10pm in New York, try to sleep by 10pm in Morocco – no later or earlier) this will help you stave off jetlag. You could also adjust this itinerary for an arrival to Tangier via the ferry from Spain. The al Quaraouiyine Mosque. Unfortunately this is not open to non-Muslims. While they are not permitted entry to the mosque itself it is possible to view part of the interior from the entrance. This is mosque and university complex is the oldest university in the world. Recently the adjoining library was rehabilitated and visitors can enter the newly (it was built in the 7th century) refurbished library with an appointment. The Ibn Danan Synagogue is another relic of Fez history that has been restored of late. This synagogue sits in the Jewish Quarter (also worth visiting) and is privately owned but open to the public – you may need to track down the guardian if no one is present. When you’re in the mellah area also visit the Jewish cemetery. If you’re with a guide they can help add a lot of history and background to the area. Fez once had one of the largest Jewish populations in Morocco and were part of the original founders of the city. After 1492 and their expulsion from Spain many again chose to settle in Morocco. 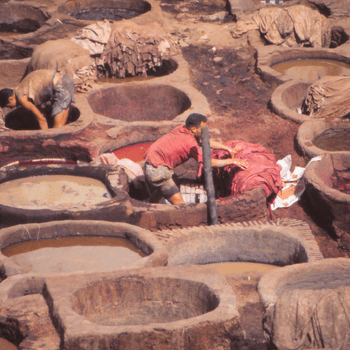 The Tanneries. Yes, you’ve seen the pictures and you really should go see it, at least once. Bring some mint sprigs to stave off the smell! Most of the viewing platforms are in the back of leather shops and the owners likely will at least try to get you to purchase something. Feel free to browse if you’d like but don’t feel bad not purchasing any leather goods from the shops if you’re not interested. Souk Seffarine – This is the metalworking area of the souk where you can see craftsmen making metal goods the same way they have for generations. It’s a small area but really interesting to see the men working to make new pieces and repair old, worn and broken pieces that locals have brought to them. R’cin – This is a neighborhood near the seffarine souk. You’ll mostly find Moroccans in this area, but there are lots of food stalls and small shops selling all kinds of things. It’s also a great lower vantage point to take pictures of the hillside of the Fez medina. If you’re staying higher up in the medina you can easily catch a cab from here to take you back up instead of walking. Nur – for dinner check out my friend Chef Najat Kaanache’s new restaurant in the former Numero Seven building. You won’t be let down! Read my full guide on what to do in Fez! Merinid Tombs – These mystery tombs are ruins overlooking the Fez medina. Someone was/is buried here but there’s no records left to know who they were. There isn’t a lot to see besides the ruins but they’re completely open and you can even walk in them. From here you’re also likely to see men drying skins on the side of the hill and you have a good vantage point of the medina and surrounding mountain ranges. Jnan Sbil – This is a large park/garden in Fez. It’s really nice if you want to do some early morning exercise or just get out of the city atmosphere for a little green space. Bab Boujoloud – If you didn’t see this on your tour of Fez yesterday and you’re close by stop and see. It’s considered an iconic landmark. Inside the door you can find several different restaurants. Many of them cater to tourists and are just ok.
Chefchaouan is a 3-4 hour drive from Fez depending on whether you have a private car and driver or will take a bus. a mid-afternoon departure should get you there with time to still have dinner. Fez Cooking Class at Palais Amani – Learn some of the Fassi food traditions in this class. Volubilis, Moulay Idriss and Meknes – Day trip from Fez to explore these nearby cities. Wine Tasting Day Trip – Yes, there is wine in Morocco. For those who imbibe this makes for a full day trip to learn more and taste different Moroccan wines. There isn’t a lot to see in Chefchaouan aside from the dazzling blue color that everyone comes to see. It’s a relatively small city so spend your time wandering around and taking as many pictures as you can stand! If you’re more active and the weather is right you can go for a hike to the waterfall, Cascade d’Akchour. There are a few other hiking trails around the area too. Worth keeping in mind this part of Morocco is in the heart of the kif growing region so don’t be too surprised if you’re offered drugs. You likely will see people openly and discreetly smoking hashish. It is tolerated to some extent but it is technically illegal. This is something to keep in mind if you decide to take up any sellers on their offer. Looking for more info on Chefchaouan; Weekend in Morocco: Beautiful, Blue Chefchaouan? For this day decide if you’d rather spend another day in Chefchaouan relaxing, add a day to Tangier or to Fez. You can’t go wrong with any option, it’s just a matter of what you would choose to do! A third option is to travel to Tangier via Tetouan. Stop in Tetouan for a day of exploring before continuing to Tangier to continue your your tour. Liars, and swindlers, and spies – oh my! It’s true Tangier has quite the reputation from it’s seedy past. It’s also one of the few cities in Morocco that doesn’t quite feel “Moroccan enough” but if you’re in this area, and want to see it – go! Many famous literary expats called Tangier home over the years; Paul Bowles, William Burroughs, and Jack Kerouac to name a few and that literary history remains today. The Kasbah – This was the original fortified city of Tangier. Inside you can visit the kasbah museum which houses relics of those who resided in the region beginning centuries ago. It’s also a great place to wander the streets which have glimpses of all the peoples that called Tangier home; English churches, Spanish doors, art deco metalwork, and of course plenty of Moroccan elements as well. There’s also a great rainbow staircase for some fun pictures! The American Legation Museum – Morocco was the first country to recognize American independence in 1776. This building was the first American public property outside of the USA. Today it’s a cultural center, museum and library. During WWII it served as the headquarters for US intelligence agents in the region. Zoco Chico – Is the name of the main square in the medina. It’s basically the heart of the medina and a prime people watching spot. Cinema Rif – A non-profit theatre screening the latest films produced in Morocco and the region and North Africa’s first cinema cultural center. All screenings are posted on their website. There’s also a cafe that is located right next door with lots of outdoor tables. Librarie des Colonnes – this is a small independent bookshop that has books in many languages and regularly holds events like author readings. Ideal for a book lover or if the weather isn’t too great, a good place to spend some time. Cafe Culture – Tangier has a really great cafe culture. In the medina and kasbah you won’t be let down if you simply slip into one, order a tea or nus nus and spend sometime reading or people watching. 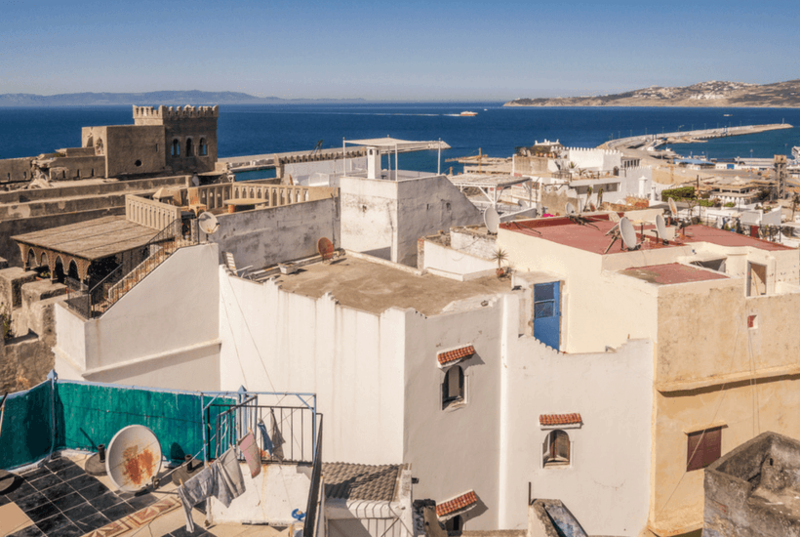 4 Hour Tangier Sightseeing Tour — See the highlights when you have limited time. 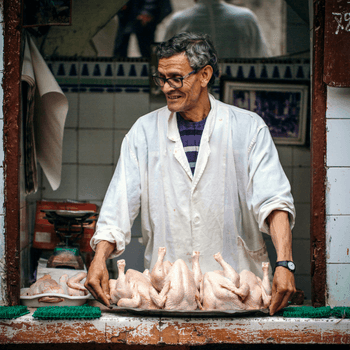 Tangier Cooking Class — Love food? Spend your day in Tangier cooking! Tangier Shore Excursion – Arriving to Tangier via ferry? This tour picks you up at the port to explore. Cap Spartel and Cave of Hercules – On your way out of Tangier schedule in a stop to these spots. It’s only a 15 minute ride out of town. It’s claimed this cave is where Hercules rested while completing his 12 labors. The cave opens up in the shape of the African continent and that in itself is quite remarkable! Avoid those passing themselves off as guides, you don’t need one. Admission to the cave is 5 dirham. The Beach and Corniche – go for an early morning run or walk on the beach or corniche. Watching the sunrise over the Mediterranean has it’s perks! Have a little more time? Head to Asilah the little pearl on the coast. If you’re visiting in July/early August this is a must stop for the Asilah Arts Festival. But if it’s any other time of year it’s a great visit too. The laid back vibe in this town and a very Spanish feel is what sets it apart. Contrast the whitewashed city to Chefchaouans’ blue and you’ve got a holiday in color! There are lots of international flights landing in Marrakech and adding this leg onto your ticket is well worth the cost. It can save you half a day or more of transit time. When you book your accommodation do request a transfer from the airport. It will help start your vacation right. It also could be helpful to have your riad prepare dinner for your first evening. A week in Marrakech might be too long so I’ve added on some additional trips you can include. The Badi Palace – this palace is essentially ruins as its contents were stripped and moved to the palace in Meknes in the 1700’s. But it’s interest to walk among them and makes for great pictures. Be sure to walk all the way through the back, past the sunken orange trees. Also climb the building steps for a great view out over the city to the High Atlas and across the medina. Maison de Photographie – I love this little photography museum because it brings Marrakech of old to life. You might be surprised by the contrasts and similarities. A Food Tour. It only makes sense to suggest you consider taking a food tour with us. Our tours go where the locals are to help you discover authentic Moroccan food. Choose from our evening tour or medina mix food tour. Sometimes the best thing to do in Marrakech is nothing, aside from absorbing the place. That’s why I don’t think checking things off a list is the best way to experience the city. Make sure you take time to sip tea, sit on a terrace and read a good book too! 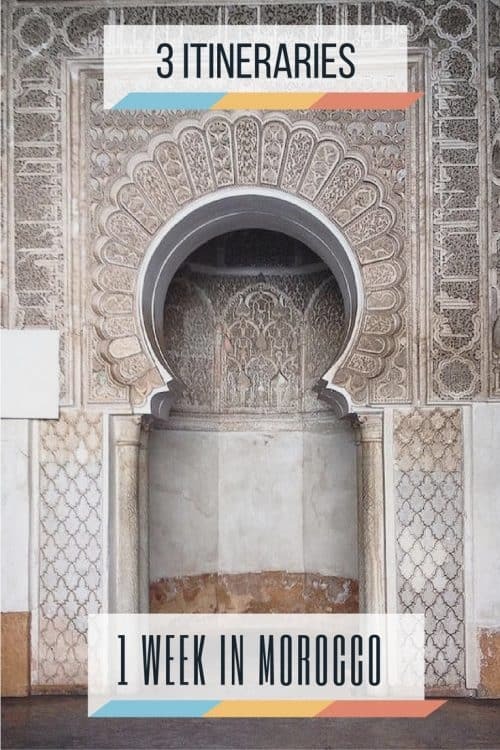 Book a Hammam treatment – Moroccans still use the hammam religiously. These traditional baths are a unique experience though you may prefer the more spa atmosphere to the neighborhood version! It’s worth noting most people prefer a good nap after the hammam so plan accordingly. Lunch in a Garden – Le Jardin and La Famille are two beautiful restaurants to enjoy lunch while being surrounded by a gorgeous garden atmosphere. You’ll feel like you’ve found a secret hideaway. Wander the Souks – You can’t make it to Marrakech and not spend some time wandering, watching and maybe choosing a few things to go home with you. You’ll be talked to non-stop by vendors but do your best to let it go and enjoy the experience. Multi course Moroccan dinner – to get a real feel for a Moroccan feast plan a dinner at Dar Moha or Libzar where the kitchens are headed by Moroccans who take pride in presenting their national dishes to guests just as they would to family. You won’t leave disappointed – or hungry! If you’re ready to get out of the city, head to the mountains. There’s no shortage of places to go but a few of my favorites are below. Ourika Valley – this is the closest to Marrakech but prepare for crowds on weekends as lots of Marrakechi’s also leave the city for this valley. Go all the way to Seti Fatima, enjoy tajine cooked over charcoal along the river and walk up to the first waterfall if you’re a confident hiker and the weather is good. Ourigane – A small Berber village that boasts a natural salt mine and gorgeous vistas in the country. You won’t find tourists here but go with someone who knows the area and can also help arrange lunch with a local family. So good! Imlil – I love, love, love this village. It’s high up in the mountains, almost to the Mount Toubkal so in winter you should prepare for cold and snow. 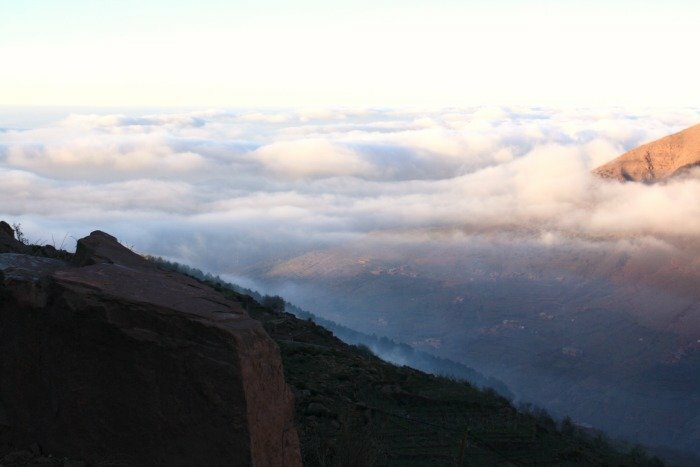 It is completely possible to do this as a day trip but it’s also worth booking at least one night at Kasbah Toubkal to enjoy the view, the food, and relax. You also could arrange to visit on a day trip and have lunch with a Berber family and try your hand at bread baking or weaving! Oukaimden – if you visit in winter and you are a decent downhill skiier then you need to go to Oukaimden just to say you’ve skiied in Morocco. There are rentals, it’s mountain skiing, and there is a lift up. If however you’re a novice stick to lower hills or a sled. You might also want to read this post on day trips from Marrakech worth taking. If we didn’t live in Marrakech, we’d live in Essaouira. It’s a like a little sister to Marrakech, with plenty of things happening, a laid back vibe, and lots of art and culture. True, there’s not a lot to check off and see but it is a great place to explore if you’re more interested in getting to know a place. Visit the port and buy your lunch – the port itself is worth seeing, but come around 10am any earlier and it will be mostly empty. The iconic bobbing blue boats, fishermen hawking whatever they’ve brought in, and the old Portuguese walls make for some great pictures. You can choose whatever fish you’d like and then take them to be cooked in grills or kitchens. If you ask the vendors they’ll point you in the right direction. Coffee and people watch – Yes you really must. Saddle up in a seat, order something to drink and chill! There are a lot of cafes right on Place Hassan II (the main square area of Essaouira). Many also offer food but it’s up to you whether you choose something basic there or opt for something a little more special. Wander the medina streets – it’s much smaller and more compact than Marrakech with half the hustle. You won’t get lost here! You’ll also discover there’s a lot less hustling to buy things so take your time and look around. Dinner at Umia – this might be my favorite restaurant in the entire country and if you can make it for dinner here you’ll really be in for a treat! The prices are reasonable but it books up, make reservations ahead. Go for an early morning walk or horse ride on the beach. There is a main beach right in the city that many people take advantage of but there are also other beaches nearby. You can book a horseback ride to go a little further away from people and discover some of this areas’ beautiful coastline. Take a cooking class with a local. I adore Khadija and her kitchen cooking school and think you would too. She loves meeting new people and has an infectious smile that will leave you happy too! After cooking you get to enjoy the fruits of your labor. Visit the mellah and skala – The mellah is the old Jewish quarter of Essaouira, since mostly abandoned. Much has been done in recent years to restore some of the synagogues and the general area. The skala is the ramparts that make up the walls of the Portuguese fortifications. It’s also where scenes from Game of Thrones were filmed. It too has just completed having renovation works done. Overnight or return to Marrakech – choose to spend another night here or return in the evening to Marrakech. Last minute shopping! Don’t lug everything around with you, get it before you leave. Make one last souk tour to pick up any last minute items you might have missed. Visit Majorelle Jardin – This is the most photographed and iconic site in Marrakech. If the weather is nice it’s an ideal stop. If you’d rather avoid people head to Koutoubia Garden or the Harti Jardin, both are free! High tea at the Royal Mansour – You need to just see the Royal Mansour because of it’s gorgeous architecture and design! Book a high tea in the afternoon and be ushered into this fantasy world! With a little more time why not take another day trip. You could add on one of the trips in the High Atlas section above or head up the coast to the little village of Safi. 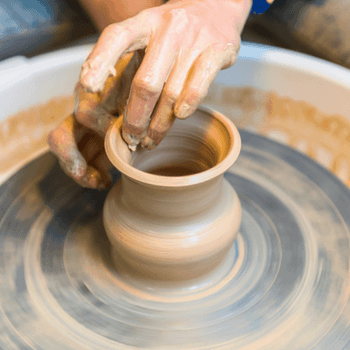 It’s the pottery headquarters of Morocco. It’s a small city making it very possible to visit in a half day. Along with pottery they are well known for seafood so make sure to enjoy a fish tajine or some Atlantic shrimp. With just a week in Morocco this itinerary will really be pushing it. I’m giving you these options because a lot of people really want to see this part of Morocco. You should feel free to delete out portions of the itinerary that don’t appeal to you in favor of staying longer in one place or another. You’ll want to start from Marrakech if at all possible for this itinerary. A Casablanca start will add on a lot of travel time and make it potentially not possible to do in a week. This itinerary includes a trip to the Sahara desert. It’s worth noting that you can not take a day trip from Marrakech to the Sahara, you can do an overnight trip (2 days and 1 night) but I wouldn’t recommend it. A 4 day, 3 night trip is ideal. You could depart immediately on the day you arrive if it’s an earlier arrival or spend the night, get your bearings and leave in the morning. Start your trip with a four hour drive over the High Atlas Mountains to the city of Ouarzazate. You also could go a bit further and spend the night in a smaller city closer to the desert. There is a lot to see between the mountains and the Sahara and villages after the Atlas Mountains but before the Sahara are some of the most beautiful and interesting to visit. Lush oasis, valleys and amazing rock formations are all worth a stop and some time. Plan a stop at Ait ben Haddou or Telouet to see fortified kasbahs in their authentic state. Spend the night en route to the desert. There is more to do in the Sahara than you might think! Today you’ll make the final push to the Sahara and then jump on your camels for a ride to camp. You don’t always have to take a camel to reach the camp, some are more remote and require a 4×4 but there are always camel rides as an activity. We’ve gone sandboarding, visiting a nomad school, made bread in the sand and more during our stays in the Sahara! Different camps have different activities and programs so make sure to find one that fits what you enjoy. See above! Spend your second night under the stars. Leaving the Sahara you have the option of going to Marrakech or Agadir (some people go to Fez as well but I only recommend this if your return trip departs from Fez). The city of Agadir is known as a beach destination and doesn’t have the historical charm of other cities due to an earthquake in the 1960’s that demolished most of the town. Head north to the surfing village of Taghazout about 25 kilometers north. It’s great for people who want to enjoy the beach, small town coastal life and especially surf. Relax! You could visit Tamri or “the banana village” a bit further north from Taghazout where banana fields and the yellow fruit fill the streets! 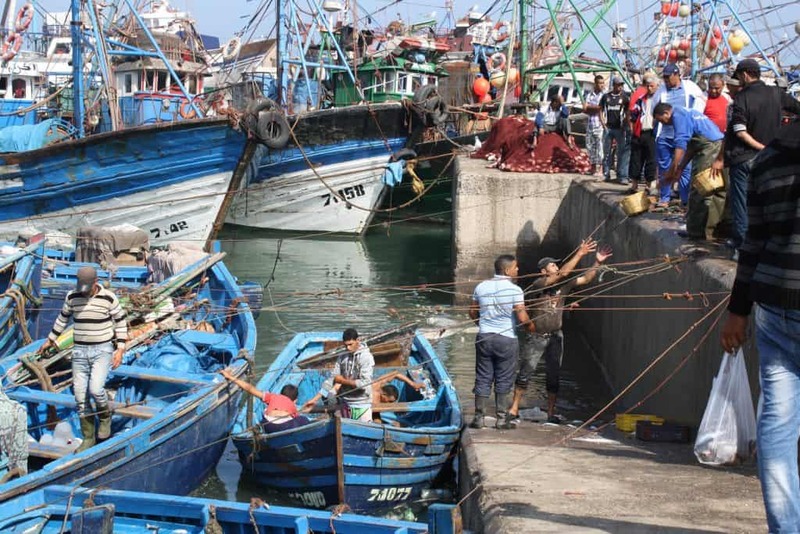 Walk to the small port where small fishing boats come in and can be purchased right off the boats. There is also horseback riding and day trips to Paradise Valley that can be organized. From Taghazout you can drive north to Essaouira and east to Marrakech or back to Agadir and take the tollroad to Marrakech. The first option might be one of the most beautiful drives in Morocco, along the ocean and through the argan biosphere. The second will get you there much faster. Spend the night in Marrakech before your flight leaves in the morning and consider one of the suggestions in the Central Morocco section if you have some time to spend in Marrakech. 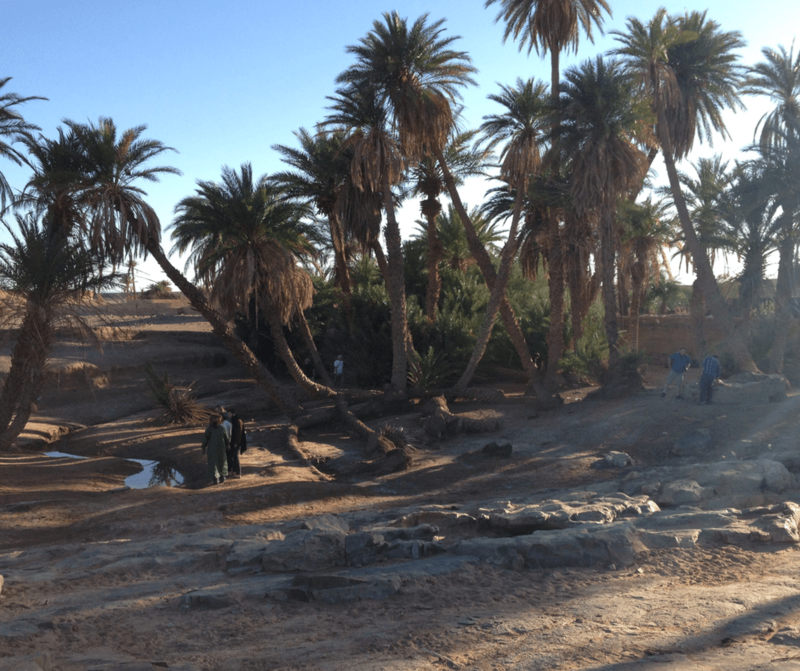 With a few more days in this region you could add on a trip to Taroudant. This small city is a reminder of how Marrakech used to be. You can walk through the medina and see craftsmen at work. This is a Berber city and has a different feel to other large cities. The walls themselves are a site to behold! If you want authentic shopping this is really a great place to go. From November to March it’s also the warmest city in Morocco! Don’t forget to check out some of the exclusive Morocco deals I have put together for you before making your decisions. Who doesn’t like to save money or get a special gift? Hello! My father and I are visiting Morocco for 11 days. We fly into and out of Casablanca – it was the only direct flight. We would love to do a 4 day/3 night Sahara excursion, but we also want to see Chefchaouen, Fez and some of the coastal towns like Essaouira and Agadir. In your opinion, are so many destinations possible in this amount of time? If not, which do you recommend we prioritize? Also, which Riads do you recommend for adult families? I’d say that’s too many places to try and do in 11 days. You could go from Casablanca to Fez on arrival and do a day or two, then do the Sahara, and end in Marrakech. From Marrakech you can go to the coast. I’d do Essaouira over Agadir but that’s just me. There are SO many riad options it’s impossible for me to suggest any until you know where you’ll be exactly and your budget. I happened upon your website and blog, and am so grateful for all the wisdom that you have shared here! I have consulted a number of other sources but keep coming back to your suggestions, which strike me as very seasoned and practical. My husband and I are coming from San Francisco to Morocco for 10 days in early March. We will be coming with our 3 sons who are 17, 7, and 7. We fly in and out of Casablanca – and I wanted to ask you, is it reasonable for us to consider renting a car? We are city-savvy drivers who have traveled extensively but this is our first time in Morocco. What I wonder most is if driving is safe for tourists, and also whether parking tends to be fairly readily available, or if having the car would be more of a burden than a convenience. I’m also debating between your northern and southern itineraries – both look appealing, but we like warmer weather so are debating if if at this time of year we will be a bit cold if we stay North? On the other hand, if we head south and try to incorporate Sahara, for example, is that too ambitious given our 10 day timeframe? Thank you in advance for your your perspective – and thank you again for the generous spirit reflected in all of your efforts! Hi – perhaps a bit late in responding as you’re coming soon. Driving in Morocco is not for the faint hearted. Parking can be very hard to find especially in cities (that’s also where it’s most difficult to drive). It’s the same safety level for tourists as us locals ;). It will certainly be warmer in the south but know that it will be longer distances between places. I can say the weather is quite nice all over the country right now though so don’t let that influence you too much. This is a very informative and helpful! Thank you! My daughter and I (mom) are planning a graduation trip which incorporates 5-7 days in Morocco. We would like to hire a guide but we don’t like to travel with big groups. What would be your recommendation? Should we just choose a couple of cities to stay, say Fez and Marrakech, and take day trips from there? I realize they are at opposite ends but how can we not go to both? The other two places she want to see are Casablanca and Chefchaouen. If you can recommend a safe, reputable private tour guide, that would be great! 2) Drive to Chefchaouen via private driver early – have afternoon here. With five days you can’t really do both, in my opinion. I’d pick one region. Alternately you could do just Fez and Marrakech and fly or drive between the two (its about an 8 hr drive). My husband and I are coming to Marrakesh in June with our 3 small children (ages 6,3,and 3). I was wondering if the restaurant Dar Moha welcomes children, or if we should save the experience for our next time in Marrakesh. I probably wouldn’t go with kids. I don’t think they would not allow it but it’s not super kid friendly in my opinion. However, my 1 year old son, husband and I are travelling beginning of december to Morroco for a week – flying in and out from Marrakech. 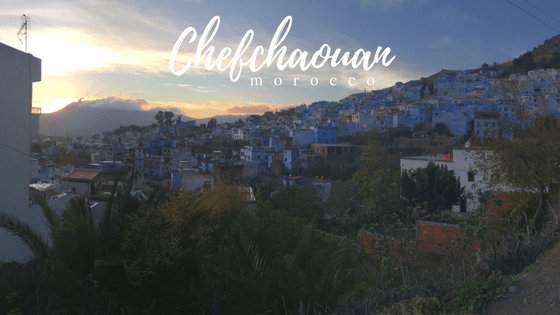 we would love to visit Fez and Chefchaouan though…would it be possible? would you recommend train or rent a car? or getting a retur flight to Fez from Marrakech? It’s too bad you’re in and out of Marrakech as those places are in the north. I’d fly Marrakech to Fez on Air Arabia (it’s like 250 dh each way per person), cheaper than the train. I wouldn’t recommend self driving if you’ve never driven in Morocco. From Fez you can either take a bus to Chefchaouan but with a little one I’d hire a driver and do a day trip or overnight trip from Fez. 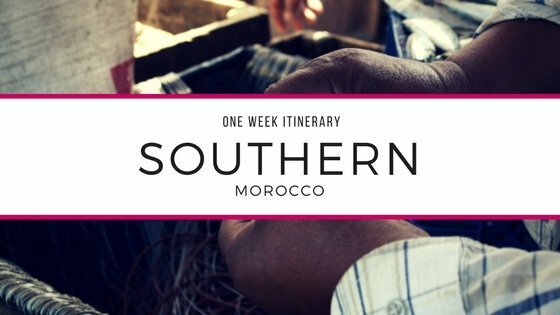 We have a group of four, and will spend a week in Morocco just before New Year, and would love to follow your ‘Southern Morocco’ itinerary. Could you recommend a local company who can provide the tour? Hi – Checkout out [email protected] – they can def help do a similar itinerary. Just mention my website and Kathi (owner) will know! 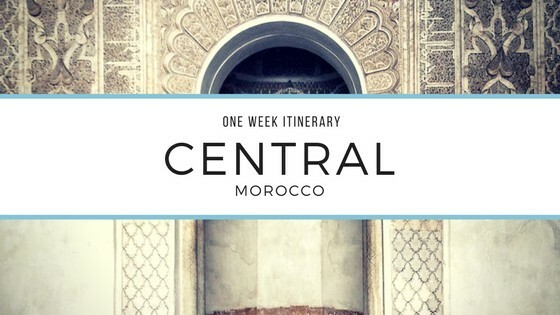 a friend and I will have a week in Morocco just before Christmas, and I love your ‘Central Morocco’ itinerary. Can you recommend an organization that offers the tours to the mountains. What you’ve written about Imlil and a visit to a berber family sounds amazing. I would love to look into it a bit more. Great article, thanks for all the info! I will be in Morocco for just over a week in January. I’m not sure how I’m getting there yet, but I’ll be coming from Portugal so it won’t be too difficult. Is it possible to go to Fes, Chefchaouen, Marrakesh, and Essaouira in 8 or 9 days? I was considering flying in to Fes and out of Marrakesh. I don’t want to spend all of my time in transit but I also want to see some of the countries highlights (with my minimal US vacation time). Any input would be appreciated, thanks! Possible yes but you’ll be spending a lot of time traveling. If you do want to do that then I would say you should fly in to Marrakech/Fez and fly out the other way to minimize travel time. I think we did quite a lot in our 1 year of living in Marrakech. Actually managed to cover the Sahara on a tour. Did Chefchaouen and Fes, Essaouira, Oukaimeden. Cities we need more exploring and planning to head back to are: Tangiers, Casablanca, and back to Marrakech and Essaouira again cause it will always be a part of me. Deep down I was a once (always will be) a Marakshia.